Tangy sauerkraut seems to be made for the crock pot. The sauerkraut cooks slowly, releasing its savory liquid and flavoring all of the other ingredients in the crock pot. Cooking sauerkraut in a crock pot is as simple as rinsing the sauerkraut and putting it in the slow cooker. The crock pot does the rest of the work. 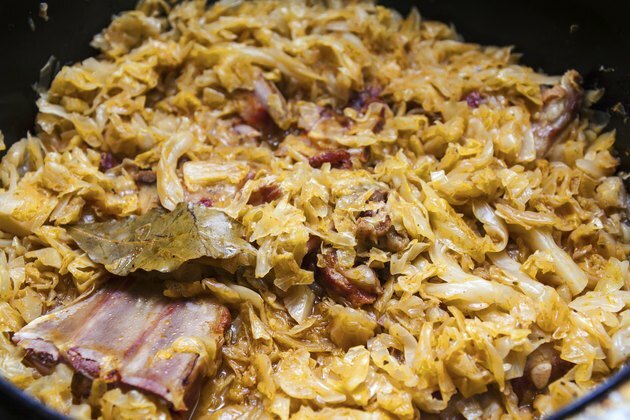 Whether you cook your sauerkraut alone or with other vegetables or meat to make a complete meal, the whole family will love this tender and highly flavored dish. Place the sauerkraut in a large bowl and fill the bowl with water. Soak the sauerkraut for five minutes. Drain the sauerkraut into a colander. Rinse the raw sauerkraut under cool water. Press on the sauerkraut with your hands to extract the water. Repeat the soaking and rinsing twice more. This will rid the sauerkraut of any dirt as well as soften it for cooking. Place the sauerkraut in the crock pot and add the the water or the wine. Cover the crock pot and cook the sauerkraut for eight hours on the "Low" setting or four hours on "High." Remove the sauerkraut with a slotted spoon and serve it hot. Add salt and pepper to taste.